The models and diagrams are intended for personal, non commercial use only. 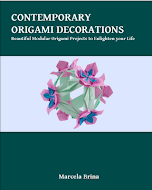 Copyright of the origami models and diagrams belongs to the creator/designer/diagrammer. The diagrams available in this page can be linked, but cannot be uploaded to other sites without my written consent. Marcela .... great job on your website!!!! And thanks so much for sharing your beautiful diagrams. I folded the Pumpkin tato so far and just love it! Your tree is cute. However, I think that the trunk module should be 9.6 inches instead of 8. Am I right ? Thanks for your comment. The model in the blog entry (the green/brown that stands in the front of the snowy one) is folded from commercial origami paper. The leaves modules are made from 150 mm/5.9" tant paper and the trunk from 200 mm/7.9" Folia origami paper. So 6" for the leaves and 8" for the trunk will work fine, although I see no harm in using a bigger paper for trunk. I just saw your FLOWER CUBE BOX. It's fantastic. Do you have directions for this???? I don't have the diagrams for this model yet. What is the size of the paper for the valentine's day card and heart? Hi, I was wondering if you have instructions/a diagram for the origami orchid that is on your blog? 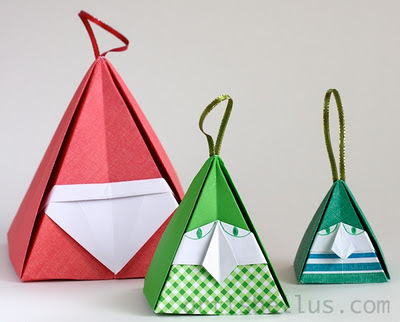 Can you help me with the module for the 3-D origami snowman? I can't find any directions to make an icosahedron with 5 squares of paper. You can find the instructions for the module for the 3-D origami snowman in the book Unit Origami Essence, by Tomoko Fuse, page 78. Hope this helps! I haven't done a diagram for the origami orchid yet. Regards. My 6 years old son is very interested in origami. Would advise any book or method or web or patterns for very young beginners? Saludos para tí y tu familia!